Well, to be honest, I wasn't all together impressed with By Design : God's Distinctive Calling for Women, by Susan Hunt. I think this is the second or third time I've approached something by Hunt and had some difficulty. Her manner of expressing herself just doesn't jive very well with me and I struggled through the book as a result. That, even though I was prepared to like it and agree with it whole heartedly. The argument in this book is that men and women were created differently and are designed by God to do different things. Hunt does not believe that men are superior to women, but that they do have a different role to play in life than women do. In all of this, I agree with her. Her argument is that women were designed to be helpers and she goes on to define and describe her view of Biblical womanhood through scriptures and various examples. She makes her point but it's hard for me to conclude the she makes her point well because I just don't connect to the way she goes about attempting to clarify what Biblical womenhood should ultimately look like and/or be. The main point she stresses is that women are to be helpers. By this she means that we are designed by God to be nurturers and to feel emotions and have more compassion than men. In this way, she says, we are able to hear and see needs when men frequently overlook such things. Because women are designed to be more emotional, they have compassionate hearts that wish to reach out to the poor, the lost, the needy and the weak among us. The whole of her book is filled with example after example of women who heard about or witnessed needs and then went about working to fulfill the described need. I see what Hunt is trying to do by arguing in this manner and I agree with her basic points. But as she pointed out so clearly, women are much more emotional than men. And this book came off as an emotional plea to use emotions to work in the home, church and society at large to bring about change. Again, I see her point and I rather agree with it. However, as I read through it I kept thinking about how a few specific people I know would react to reading this and I think that Hunt would have a terribly hard time getting through to them to argue herself out. Mostly because she doesn't really "argue" or present factual information. For instance, she tries to make one of her points but using the game of chess as an example. To begin making her point, she says, "Now, I don't play chess but a friend told me..." (Given that I married into a chess playing family, I rolled my eyes at this example and wished she had decided to relate what she was trying to say to something that was familiar to her. That old adage about "writing about that which you know" was running through my brain as I read on.) Hunt also stated at one point: "my unscientific observation is that..." which made me want to shut the book, quite honestly. Due to the fact that she discredited herself and her observations so many times (albeit unintentionally), it made it hard for me to want to read it or to even talk about it online. Why? Because I agree with her that society has a serious problem when it comes to defining and supporting the individual (and different) roles of men and women. I do believe that the feminist movement of the 1960's was detrimental to the family and the home in many ways. That said (and this is an In All Honesty Post) I don't know that I can articulate my reasons why I believe that the church, primarily, and society, secondarily, needs to acknowledge that men and women were created to be different. I do believe that men were called to be leaders and women were called to be their helpers. I do not believe women are dumb, are supposed to be silent on all issues at all times and are lesser than the males. I believe that they are designed to compliment the men and do great things in their own right. I have a multitude of thoughts all jumbled up in my head about this which I'm working on ironing out and thinking through so that I can better articulate my belief system. Therefore I am on the lookout for books which helpfully spell out the arguments a bit so that I can work through my own thoughts in an orderly way. 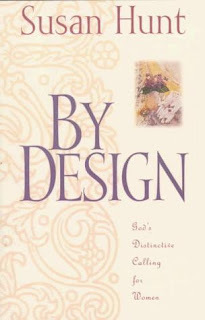 I would say that By Design is a call to action to women who are in the church and believe that they have a unique design and purpose in conjunction with men. If you agree with Hunt already, there are a few things in this book to be encouraged by. But if you don't agree with her, or if you are sorting through your thoughts in order to better articulate them, you will likely find this book lacking. It feels more like it is "preaching to the choir" -- which I am a part of -- with a little too much song and dance and not enough thoughtful, Biblical argument. It's definitely back to Grudem for me! The cover alone is a turn-off. I had to go back and check and see if this was the same author I wasn't too fond of in a couple of previous books, and it was. But in those books her writing was more clinical to me. I don't like real gushy emotional books written to women, but she seemed to go too far the other way, at least in what I've read of hers so far. If you've never read it, I would highly recommend Elisabeth Elliot's Let Me Be a Woman. That was a big help to me if forming my convictions about the differences between men and women. I liked Let Me Be a Woman several years ago. Hunt sounds like she takes an average difference between men and women and tries to apply it to everyone, rather like saying that because men are taller than women, on average, men and women have different roles and should do different things. The "tall" argument doesn't consider the fact that the variance in people is much larger than the average difference between two groups. I'd be interested in a book that both considers the different gifts of people (men AND women) and recognizes that a higher percentage of Christian women remain single, not entirely of their own choice but because men don't wish to marry them. Based on my own observations, I think 80%+ of women desire more of a nurturing/caring role than their husbands have. A few women are not interested and it's fortunate when they marry that are interested in nurturing. Orthodox Jewry has an interesting blog (orthonomics) on which the income earning role of women is often discussed. In conservative Judaism, unlike conservative Christianity, the primary income earner is usually/often female in the modern US. @Barbara H. & Taia - I believe I DID read Let Me Be a Woman back in my late teens but that was a little while ago and I could probably stand a re-read. EXCEPT (deep breath) E.E. is actually a hard one for me to read and identify with! I always feel like I'm walking away with a list of rules I must follow after reading her. (My natural inclination is to follow rules but with E.E. I feel it more dangerous for my personality.) She has much to share though and perhaps I would appreciate more of her works being a little older now. @Taia - Yes, I'd say you summarized what Hunt did quite nicely. She takes averages and then emotionally pleads her case based on those averages. It just doesn't work very well. I firmly believe people should be who God made them to be, whether that fits some third parties' wild generalizations of how they THINK God made things or not. I too read this book expecting to agree with it and learn from it, but I found it very difficult to follow. I didn't think it was written nor organized well. For biblical womanhood, I loved and recommend Feminine Appeal. I also want to read Womanly Dominion. Carrie, this review undermines your claim that you lack thinking skills. I agree with your analysis, and also with the comments by Taia and Carrots. The use of the height analogy actually highlights the problem with both the feminist and the "Christian Woman" viewpoints. Women (and men) are NOT homogenous groups. Both feminism and the usual "Christian" perspective insist that women (and men) must bend themselves to fit a particular role. For a doctrinaire feminist, this means a woman must work outside the home, earn as much as her man, never let him have his way (aka "dominate"). If she doesn't she is betraying the cause. For the "Christian" perspective, this means that the woman must never work outside the home, must have the primary child-raising role, must be emotionally sensitive, nurturing, etc. If she doesn't, well, she is living in sin. But just like height, we are different. I am shorter than the average man. I am also the more nurturing parent in our family. (Although I suspect the overall empathy level is similar to Carrots' family) By acknowledging this fact, and deciding to ignore the "roles", we have found our own way of dividing up what needs to be done - both at home and out of it. I love Taia's observation that men do not want to marry these women. For every expectation that is placed on the woman, there is one that is placed on the man. These expectations have increasingly driven men from marriage, and from the church. @Carrots - This book would probably make you mad, yes. ;D (I'll not soon forget the fire which flashed in your eyes briefly in Seattle when discussing the role of women.) Heh. I don't think we agree on this topic, but this certainly wouldn't be the book I would hand over to prove "my" point on Biblical womanhood to you or anyone else. I suspect you would be pretty ticked off within the first few sentences. @Caniad: I'm with you on the book cover. I'm already leery of "women's roles" books and ones with gloves and purple flowers on the cover would really make me shy away! I think it's slightly obnoxious to have books like this. I mean, if you are a woman who really honestly is questioning our society's view of women and want to know what the bible teaches, it seems this book wouldn't be too helpful. I'm not sure I know very many women who enjoy being told "You think with your emotions...so let me give you a big pile of emotions that will appeal to your emotions so you will respond emotionally and believe what I say....based on emotions." If you are a more analytical woman (they exist! gasp!) you probably aren't going to like that very much. That being said, I would probably end up in the choir she was preaching to, so I probably wouldn't get overly het up about it. I think I must reread Feminine Appeal. I remember liking it...but don't recall much else. One of my favorite stories about Eliot is why she wrote her book on roles for men (can't remember the title) after she wrote "Let Me Be A Woman". One of her young male relatives (nephew, grandson, something like that) wanted to read her opinions and so read (and carried around) her book "Let Me Be A Woman". It takes a strong man to carry around a book like that, she said. After a day of dealing with a sort-of sick child, I have to admit that I'm NOT the more nurturing parent in our home. And that's all I'm going to say about that! Carrie, I meant that as a compliment - never sell yourself short! I am finding the polarization regarding the cover art to be fascinating. Isn't marketing fun? I don't hate the cover but it doesn't compel me to read the book. This is a topic that I find my opinions changing and a bit murky on at the moment. As I ranted to you in a recent email, I don't consider myself a feminist but I'm finding myself confronted in Christian circles with the idea that the wife must consult her husband on all decisions. I've also noticed that men are admonished to lead (make decisions) while women are told to serve. I have some big problems with both of those right now but don't know how to articulate my thoughts. I have this on my shelf and have passed it over multiple times. Your review may make me pass it over for good and put it in the pile going to the used book store.